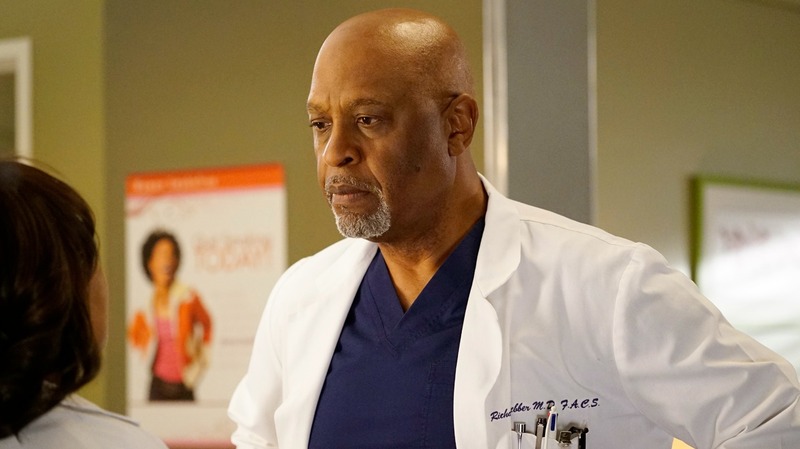 As if the prospect of Alex Karev leaving Grey Sloan wasn’t horrible enough, this week’s episode of Grey’s Anatomy gave fans a new fear: that we’ll lose Dr. Richard Webber too. It all started last week when Catherine Avery brought a startling trend to Miranda Bailey’s attention — residents at Grey Sloan do not seem to thrive. The skirmish between Alex and DeLuca was the latest in a long line of drama between attendings and residents. Her suggestion? They bring a third party in to assess the residency program. Yes, as in the one run by Catherine’s own husband, Richard. To make matters worse, this was all done very cloak-and-dagger behind his back. Bailey, girl, I thought better of you. So in comes newcomer Dr. Eliza Minnick (Marika Dominczyk) to seriously shake things up. Her first order of business is chatting with all of the residents to determine any issues they may have with the attendings. Naturally, this is a move that puts the attendings on edge. She also horns in on several procedures being performed by the attendings and basically plays backseat driver — surgeon version — the entire time. The kicker, though, is that despite the fact that no one particularly likes her, Minnick makes sense. Even Maggie admits her methods work. Heck, even Webber comes around… well, thanks to a “little push” from his sweet geriatric patient and her adorable ride-or-die. What’s the problem then, right? Minnick can come on board, and she and Webber will work alongside each other to reform the residency program. Only nope! That’s not gonna happen, because near the episode’s close Minnick explains to Miranda she works alone. In other words, Webber has to go. Now, hold on just one hot-damn minute. Are you listening, Shonda Rhimes? You better not take Richard from us. We sat idly by (read: sobbed uncontrollably and threatened to boycott) when you ripped McDreamy from our clammy superfan clutches. And since last season’s finale, the threat of Alex leaving has been looming over us like some horrible albatross. It was just last episode, in fact, that Alex seemed to confirm he would soon be leaving Meredith and everyone-slash-thing behind. More: Did Grey’s Anatomy‘s Alex Karev just confirm he’s leaving the show? Still, we soldiered through those tiny daggers to the heart because, well, we’re apparently all masochists. Also, though, because we are invested. These characters have been in our lives longer than a lot of our relationships. But the buck stops here. I draw the line at Richard. You can’t have all of the OG Grey’s guys — you just can’t. I’m all for female empowerment, and I’ve very vocally been a fan of the direction the show has taken these last few seasons. Richard being written off the show might be the proverbial last straw for this fan, though. Why? Because the show just wouldn’t be the same with him. Yes, I realize that’s probably something we all said when McDreamy died, and yet here we are. However, it’s different. In the beginning, the “Grey” in Grey’s Anatomy pointed just as much to Ellis as it did to Meredith. Ellis and Richard were the bones the show was built around. Even though she died many seasons ago, she often makes cameos in the form of her journals or references of respect. Sometimes even flashbacks. If Richard goes, all of that history goes with him. The show would feel decidedly less familiar and comforting. Because that’s what he is, you know? Richard is one of those characters who — even when you don’t agree with his decisions — feels like coming home. Go ahead — shake things up. Just don’t shake Richard right out the door, because you might also shake a few fans who’ve been losing their grip ever since you got rid of McDreamy. What do you think? Would you be upset if Richard got written off?